The best gluten-free pancakes! This is a gluten-free pancake mix with a dairy-free and vegan option that is simple to make, a tried and true gluten-free pancake recipe, and can be made right away, or stored for future use. These gluten-free pancakes are fluffy and scrumptious. 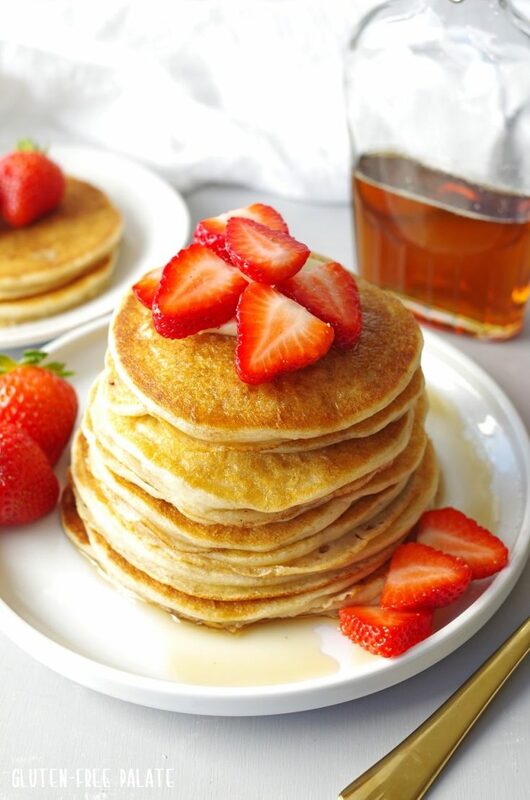 Double this gluten-free pancake recipe and make half now and store half the dry mix for later! Do you need grain-free pancakes? Try my Paleo Pancake Mix Recipe. It’s just as tasty, but without the grains. Everyone loves a good gluten-free pancake mix, and I love a good gluten-free pancake recipe. 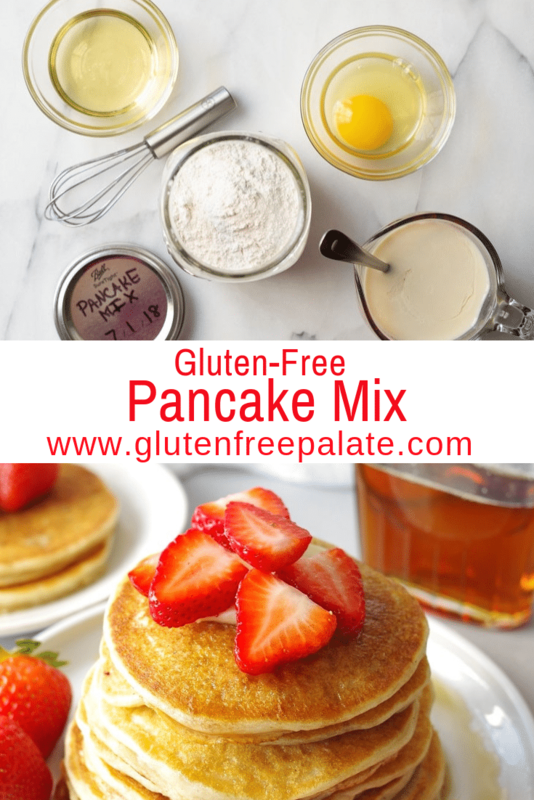 Don’t get me wrong, there are plenty of gluten-free pancake mixes to purchase (some of my favorites are gfjules gluten free pancake & waffle mix, and Pamela’s), but depending on your household gluten-free pancake consumption, the mixes can get expensive. I have a gluten-free pancake recipe in my cookbook that I’ve been making for years. About a year ago I started making the dry portion in bulk and storing it in a glass container so that my sweet husband and girls could easily make pancakes when I was traveling. 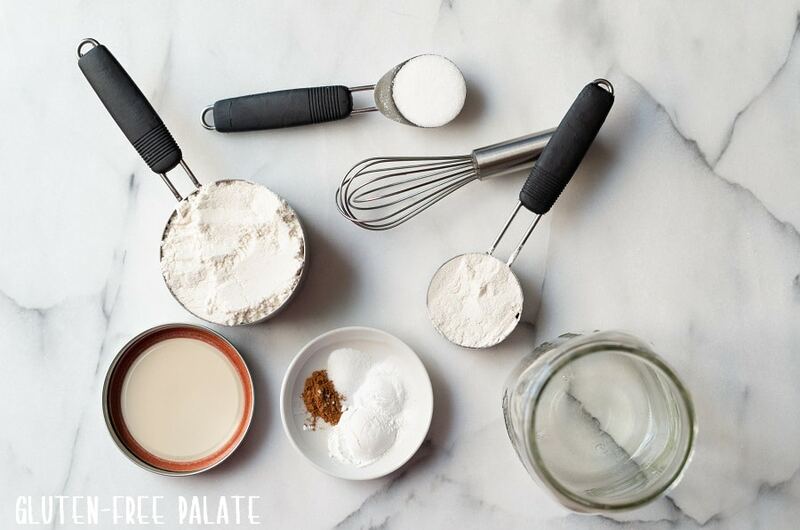 Since then, we tend to keep this gluten-free pancake mix recipe close so that we always have pre-made mix on hand. 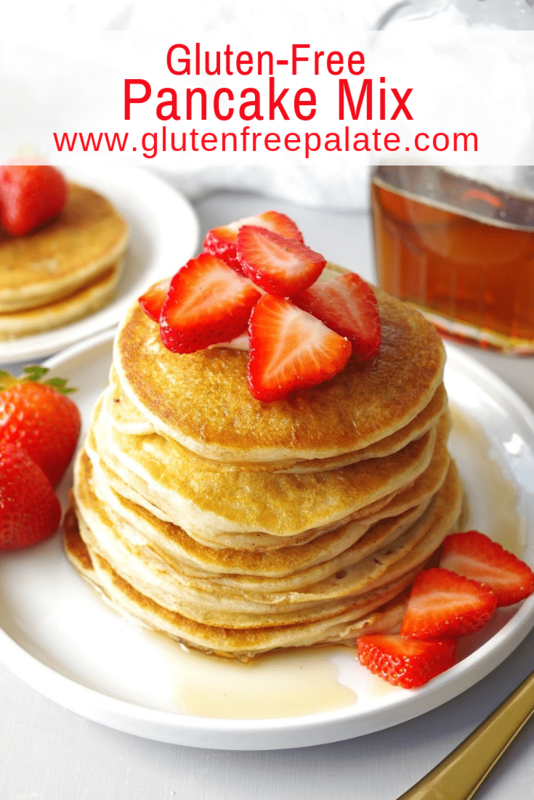 Most gluten-free pancake mixes are simply the dry ingredients combined. You always have to add the wet ingredients like milk, eggs, oil, etc. By making it yourself you can keep as much or as little as you want on hand. Also, it’s saves quite a bit of money to make your own gluten-free pancake recipe every week. We like to make up a couple batches of pancakes and keep them in the freezer for busy mornings. My girls pull them out and re-heat them for a delicious homemade breakfast. Can I make these pancakes dairy-free? Yes. 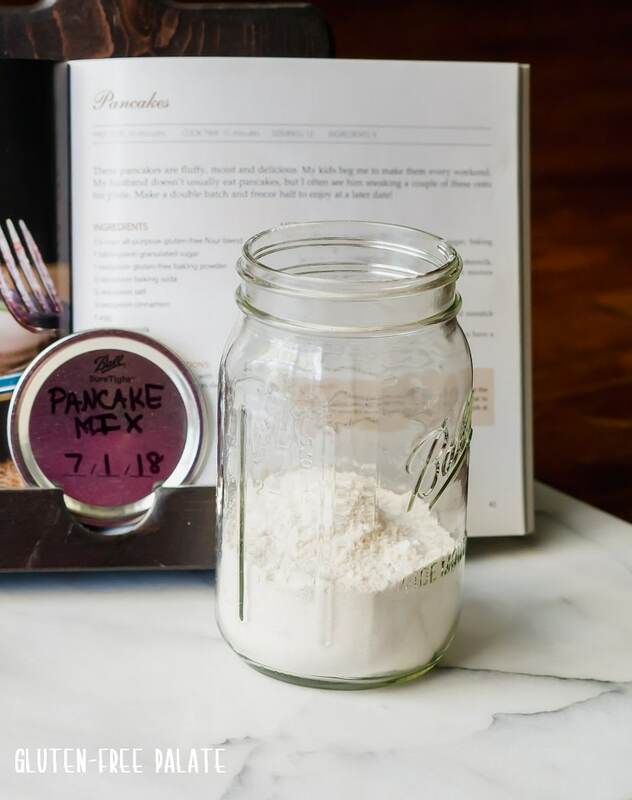 This gluten-free pancake mix recipe works with buttermilk, dairy-free buttermilk (see notes in the recipe), milk, or dairy-free milk. I like to use buttermilk or a dairy-free buttermilk in this gluten-free pancake recipe because it makes them thicker. For thinner pancakes use milk, or a dairy-free milk. These gluten-free pancakes are a staple in our house. We tend to whip up a batch weekly, saving some in the freezer for later. My girls like to enjoy them for breakfast and use them to make sandwiches. This might sound weird, but have you ever used gluten-free pancakes to make a sandwich? It’s pretty tasty. How long can I store gluten-free pancake mix? This mix can be stored in an airtight container (or glass container) for up to three months at room temperature. It may stay fresh longer, but I wouldn’t know because we usually griddle our way through a triple batch of this gluten-free pancake recipe every other week. For store bought gluten-free pancake mixes, always check the expiration date printed on the box. Can I use an egg substitute in gluten-free pancakes? I have used flax-egg and chia seed egg in this gluten-free pancake recipe before. They are delicious, but they don’t get the same rise as you would if you used eggs. For this gluten-free pancake mix recipe, use buttermilk and flax egg for a good happy medium. When I make my own mixes and my own flour blends I personally like to store them in glass jars or containers. I feel that they stay fresh longer, and they are a good storage option. 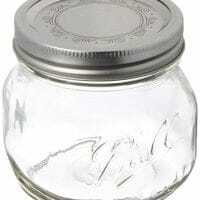 When I use ball pint mason jars (affiliate link) I purchase the lids that have spots for the date on the lid. I write down when I made the mix or flour blend so I can keep track of how old it is. Amazon stopped carrying my favorite lids (pictured above) but as soon as I find them again, I will come back and post where to get them. They are super useful! Always follow the recipe first when making gluten-free pancakes. Don’t work with substitutions until you know how the recipe works. Once your batter is ready, heat your pan or electric griddle. I received an electric griddle last year and it’s been my best friend since. Mix dry ingredients in a large mixing bowl then transfer to an airtight container if you are saving it for later. Don’t forget to label your container with the date. Pre-heat a non-stick griddle, or pan. Pour the dry pancake mix into a large mixing bowl. If you doubled or tripled the dry ingredients before storing make sure add enough wet ingredients or measure out one batch worth of dry ingredients to mix with the wet ingredients above. One batch equals about 1 and 1/2 cups (200g) of dry pancake mix. Ladle 1/4 cup of pancake batter onto your hot griddle, or pan: measure out about 1/4 cup of gluten-free pancake batter onto your hot oil-pan or electric griddle. Use the back of the measuring cup to help spread the batter some. Cook for 2-3 minutes, or until bubbles form around the edges. When the edges are golden brown and the bubbles are popping up through the center of the pancake, use your spatula and take a peak to see if they are brown to your liking. Then flip the gluten-free pancake and cook for another 5 minutes or so. Always check for doneness before you remove your pancake from the pan or griddle. This recipe can be doubled, or tripled. You don’t need an electric griddle to make this gluten-free pancake mix but I find that it’s way easier. 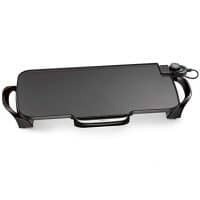 For one, you don’t oil an electric griddle. It’s non-stick. Also, the heat tends to stay even throughout the griddle where as with a pan the heat might fluctuate. Also, you can make 6-8 gluten-free pancakes at once on an electric griddle. So many people have emailed me asking for a gluten-free pancake mix recipe that they can mix up and store. I am super excited to finally get this post up for you, so that you can start whisking up your own gluten-free pancakes. If you’re more of a waffle person, then skip this recipe and check out my gluten-free waffles. Can I freeze gluten-free pancakes? Yes, you can freeze gluten-free pancakes. Always bring your gluten-free pancakes to room temperature first. After they are at room temperature you can store them in an airtight container or a zip lock bag for up to three months. Remember when measuring out flours for this gluten-free pancake recipe spoon your flour into your measuring cup, then level it. Do not dip your measuring cup into the flour then level, it will be too much flour. Did you make this gluten-free pancake recipe? Please leave a comment below and let me know what you thought! The best gluten-free pancakes! 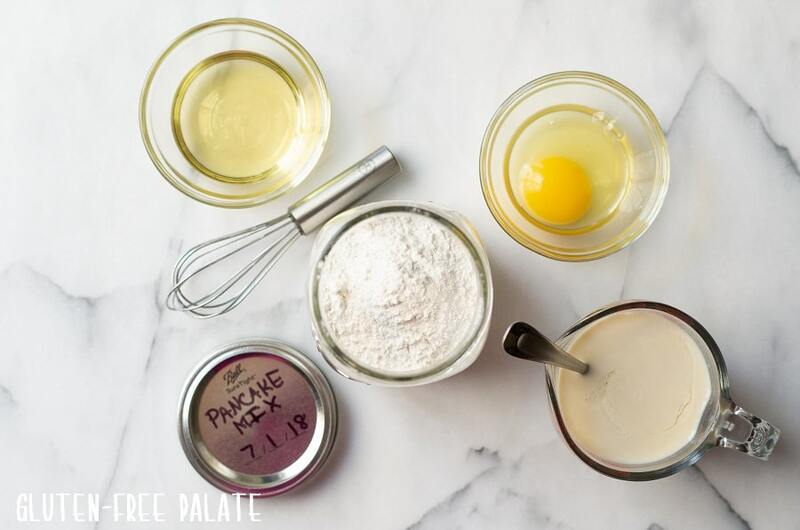 You are going to love this gluten-Free pancake mix recipe with a dairy-free and vegan option. 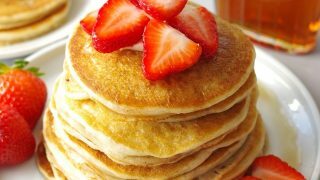 It's simple to make, a tried and true gluten-free pancake recipe, and can be made right away, or stored for future use. These easy gluten-free pancakes are fluffy and scrumptious. Mix dry ingredients in a large mixing bowl then transfer to an airtight container if you are saving it for later. Don't forget to label your container with the date. Ladle 1/4 cup of pancake batter onto your hot griddle, or pan. Cook for 2-3 minutes, or until bubbles form around the edges. Flip and continue to cook until cooked through. 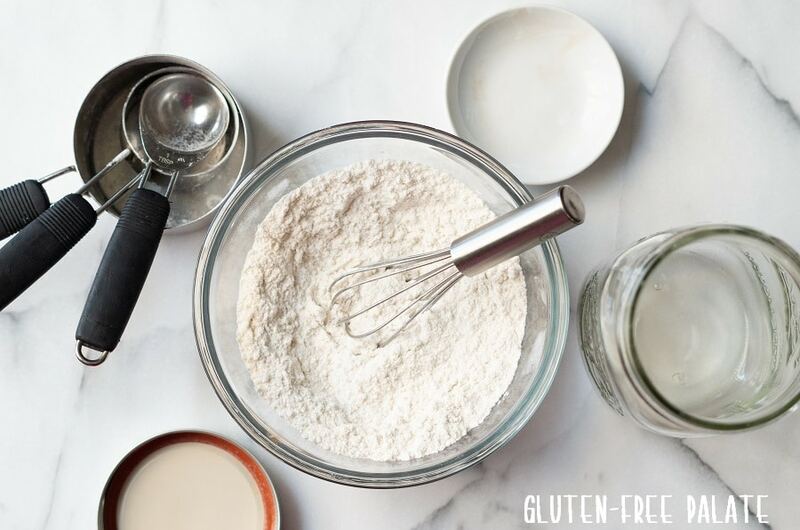 Remember when measuring out gluten-free flours to spoon your flour into your measuring cup, then level it. Do not dip your measuring cup into the flour then level, it will be too much flour. I just discovered this blog and wanted to tell you thank you for your work on behalf of the celiac community! I will be making these pancakes in the morning. And I will be spending a lot of time exploring here. Good job! I’m so glad you found me. Happy cooking and baking! I’ve had my first success at GF pancakes. This is a great recipe. Thank you. Yay! I’m so glad. Thanks for stopping by and letting me know. I loved these light and fluffy pancakes. Instead of 1 cup of milk I did 1 and 1/4 cup. I am so glad you liked them! Thank you for stopping by and letting me know. About how many pancakes will this recipe make (ihop restaurant size)? Approximately how many pancakes will this recipe make (ihop restaurant size)? I would guess six ihop sized pancakes, but I haven’t been to an ihop in ages! This is such a great recipe! Thank you so much for creating a recipe that I can use with my kiddos! We used it today for our snow day! 🙂 YUM! You are so welcome! Thank you for letting me know you like it! hi can I ask why the use of white vinegar with milk, and do you know what might happen if I didn’t include the vinegar? thanks! The vinegar and dairy-free milk is for if you want to make a dairy-free buttermilk. You don’t have to make a dairy-free buttermilk. You can use regular buttermilk, or a dairy-free milk without the vinegar. I hope that helps. Excellent recipe, I used apple cider vinegar with coconut milk, added 1/4 tsp. Vanilla and a handfull of blueberries to each cake after scooping onto pan. This is one recipe to bookmark! Thank you! I’m so glad you like them 🙂 thank you for stopping by and letting me know. So glad you liked it! Thank you for stopping by to leave a comment. I am so glad you like this pancake recipe and that your husband approves too. So glad this recipe hits his taste buds in all the right places. These turned out really thick for me. I had to add a lot more flax milk than the recipe calls for, and they were still really dense rather than fluffy. I wonder if it’s because the gf flour mix I used contains ground flax? Or perhaps the egg replacer I used instead of an actual egg? I would imagine it was both the extra flax and the egg replacer. I haven’t used a flour blend with flax in this recipe. For egg replacer, I’ve only used flaxseed + water to make a flaxegg. Hope that helps. Chrystal: I am not a celiac, but I am on a low oxalate diet, and flour is high. I have been eating a bit too much of it, and I have started my GF pancakes again. I made up your GF Flour Mix last night, and I made the pancakes this morning. Next time I will use buttermilk, and maybe a flax egg as they weren’t as tall as I could have liked, but. these were the best gluten-free pancakes I have ever made. They were light, fluffy, and I couldn’t tell they weren’t “real” pancakes. Thanks for using white rice flour as well-I would just have swapped it out if you’d used brown rice flour. I can’t tolerate that. Thank you so much for taking time to stop by and let me know that you liked this pancake recipe. I’m so glad! We love freezing them in batches too. Although I haven’t tried reheating them in an air fryer yet! Thank you for letting me know. Sadly i have looked through this article 5 times and do not see a recipe for gluten free pancakes. 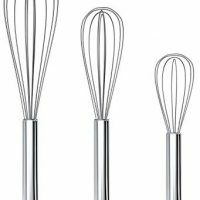 I see videos for other recipes and links to things for sale. I am looking for a scratch gf pancake mix recipe that uses no processed/prepackaged brands. Can you email the recipe to me? I’m not sure why you wouldn’t see the recipe, the recipe card with all the ingredients and instructions is just above the box you commented in. Can you let me know what browser you are using? And double check. I just looked and it’s there.